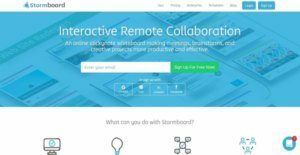 Stormboard is a flexible, easy-to-use, and interactive online brainstorming and planning solution that empowers companies and teams to capture new ideas in one place, build projects and participate in meetings remotely, and increase employee engagement. This digital meeting tool aims to eliminate dependency on traditional whiteboards, flipcharts, and screen sharing which only make it difficult to organize and retain ideas, boring to watch presentations, and prevent everyone to actively collaborate in meetings and discussions. Stormboard is equipped with a lot of remote collaboration capabilities which allow team members to share ideas, develop strategies and vote on them, and participate in meetings remotely from anywhere. With Stormboard, they will be able to put their ideas in one place and access them in real time. It also comes with built-in business processes which are available through templates and permits users to generate reports instantly. The solution can transmit ideas and data securely using 256 bit SSL encryption. Stormboard is an interactive digital meeting solution which enables users to clearly define agenda, goals, and issues so they can set up online meetings aimed at resolving their problems, achieving their objectives, or letting them create better products. In other words, the tool helps them set up all the things that they need to pursue and attain and efficiently communicate them across their team. With Stormboard, the process of collecting existing ideas and discussing new ones is a breeze. It captures all ideas and organizes them in one place, making it a great brainstorming tool. In addition, team members can contribute new ideas and participate in discussions wherever they are. The digital meeting and brainstorming tool also offers an innovative way of organizing ideas. Teams can organize their ideas into groups, allowing them to link similar ideas together. Because of this, they will be able to remove duplication of ideas, spot patterns, and highlight the best ideas. There is no doubt that Stormboard is an interactive solution. This is because it allows users to explain whatever ideas they produced and gives their colleagues the opportunity to share their own feedback and opinion with regard to those ideas. This facilitates how teams review and refine ideas, and check whether such ideas can resolve the original issues or problems they have defined. In order for teams to achieve a resolution of issues related to their products, processes, and goals; the online brainstorming and planning tool ensures that they are able to generate the right ideas to solve their problems. They can prioritize ideas, brainstorm on the best ones, and decide which idea they are going to use. Stormboard also enhances the way users present their ideas. In fact, they can produce reports in various formats which include Word documents, Excel spreadsheets, and PowerPoint presentations. As a result, supervisors and managers can easily approve the ideas of their employees or team members and plans and strategies are quickly implemented. Stormboard delivers project planning and management features which help users translate their ideas into concrete actions. For example, the solution lets them set up projects and assign goals, tasks, and milestones to their team members. As they do this, they can also set deadlines so that team members will know their schedules and complete their tasks on time. As part of its project planning and management capabilities, Stormboard provides users with the capability to monitor the progress of each project they are setting up within the solution. It allows them to apply a project tracking and scheduling approach known as Kanban. Using this approach, they will be able to visualize their entire project and see which stage of the project they are currently in and what each team member has accomplished so far. Summing it up, the solution makes it possible to review a project once it is completed. Thus, users can check all the milestones they previously assigned, the ideas the team has generated and discussed, and the solution they selected and decided to work on. If you are considering Stormboard it might also be a good idea to examine other subcategories of Best Mind Mapping Software listed in our database of SaaS software reviews. Each company has different wants and requires a system that can be personalized for their size, type of staff members and clients, and the specific industry they are in. For these reasons, no platform can offer perfect features out-of-the-box. When you try to find a software app, first be sure what you require it for. Read some Stormboard reviews and ask yourself do you want basic functionality or do you want complex functionality? Are there any industry-specific features that you are searching for? Obtain the answers to these queries to assist your search. There are plenty of aspects that you need to mull over and these include your budget, particular business needs, your company size, integration needs etc. Take your time, try out a few free trials, and finally zero in on the platform that presents all that you want to improve your organization effectiveness and productivity. How Much Does Stormboard Cost? Stormboard offers several SMB and enterprise pricing plans for all users to choose from. Most of the plans are available on a monthly subscription basis, and pricing varies depending on the size of your organization or business. For more information on Stormboard’s enterprise pricing plan, please contact the vendor and get your quote. Used in a formally accredited K-12 or higher education school. All education accounts must be registered using a valid school email address. We realize that when you make a decision to buy Mind Mapping Software it’s important not only to see how experts evaluate it in their reviews, but also to find out if the real people and companies that buy it are actually satisfied with the product. That’s why we’ve created our behavior-based Customer Satisfaction Algorithm™ that gathers customer reviews, comments and Stormboard reviews across a wide range of social media sites. The data is then presented in an easy to digest form showing how many people had positive and negative experience with Stormboard. With that information at hand you should be equipped to make an informed buying decision that you won’t regret. What are Stormboard pricing details? What integrations are available for Stormboard? If you need more information about Stormboard or you simply have a question let us know what you need and we’ll forward your request directly to the vendor.